Hi, friends! How was your weekend? I hope it was a restful one. Dave and I spent some time exploring OKC. We went to the Oklahoma Historical Museum (I actually really enjoyed part of it), did some hiking and went to a famous stop on Route 66 called 'Pops'. I'll be sharing some pictures soon. Today I want to talk a little bit about prayer. I think God's Word and prayer are the two most powerful and precious resources God has given us. As wonderful as these two gifts are, I find myself struggling to be consistent with prayer. It's something I want to work on and I've had various people tell me it is something they want to work on as well. 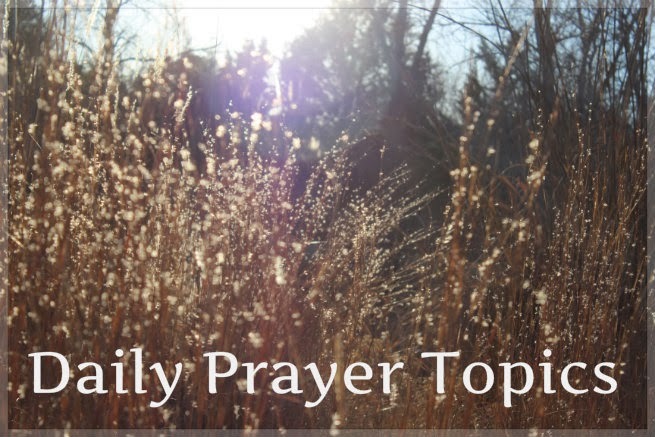 I want to share with you something called 'daily prayer topics' as it has really helped Dave and I when we pray together. Sometime this past fall I must have been thinking and brainstorming about prayer and randomly, the idea of 'daily prayer topics' popped into my head. I immediately started picking rhymes and weird words to help me nail down a topic for each day. It sounds weird (and probably is a bit weird) but it works great. I'm going to go ahead right now and give God credit for these daily prayer ideas. I even asked Dave how I came up with these ideas and he couldn't remember either. God knows I struggle with my prayer life but He knows I desire so much to pray and fellowship with Him more. I think these tools are a way to draw me closer to Him and to be intentional in praying for others. 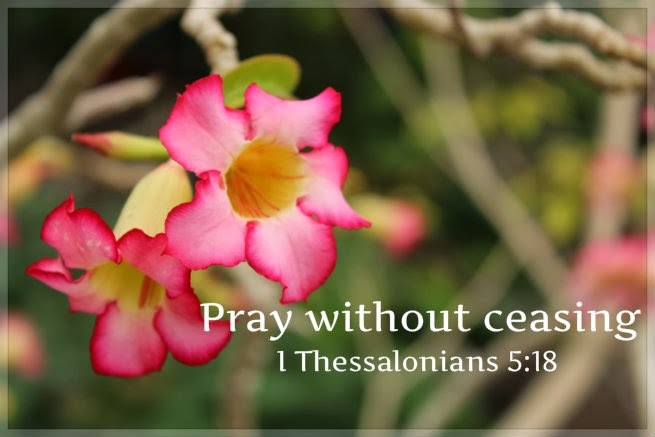 Dave and I pray together daily and while there is nothing wrong with a 'free for all prayer', having some structure has been very beneficial for us. I hope these help you with your prayer life like they have helped me. Missionary Mondays - Dave and I pray for our missionary friends serving around the world as well as those in our community who are our mission field. Wednesday - 'Our Weird Woved Ones' - I honestly don't think the majority of my family is weird but this is the only rhyme I could come up with. This day is set aside to pray for all our family. Dave and I often throw in a thankful prayer that we are in the family of God. Thankful Thursdays - A day to thank God for his blessings. Friday - Friends - A day to pray for all our amazing friends! Salvation Saturdays - A day to thank God for salvation and to pray for those who still need to be saved. Savior Sundays - A day to reflect and praise Jesus, our Savior. I'm also in the process of organizing this list for my own prayer time. I've found that writing a note in my iPhone works best for me because it is always with me and I can pull that list out at any time. Love this--so simple and so great. Thanks for sharing! Thanks, Kelsea. I hope you and your husband can eventually pray together over time. Sometimes things like that take some time. These are great daily topics! I have tried to do this in the past but always end up forgetting the daily topic or something. I guess a tip I have for consistency with prayer is to make it a priority and add it to a calendar on your phone! I know it might sound silly to have a calendar reminder for prayer, but sometimes it's what I need to keep me away from the distractions of life and focus on Him for some time. :) Another thing I like is having prayer requests from friends/family/bloggers because it helps me to pray for others more so than usual. I shared your little schedule ideas with my boyfriend and we're going to try something similar! Thanks, Meredith. I think you are right in making it a priority. It's almost like it needs to be a discipline. I like the idea of setting a reminder on my phone. I'll have to try that and see if it helps. I hope the daily topics work well with you and your bf. Prayer is something that are a must in all relationships. This is such a great idea! I like how easy it is to remember when you label them like that! Love the idea of prayer topics! I am actually planning a post on prayer because I have a. Few new things I'm doing this year to be more intentional about it! You're great. Thanks! I can't wait to read your ideas.